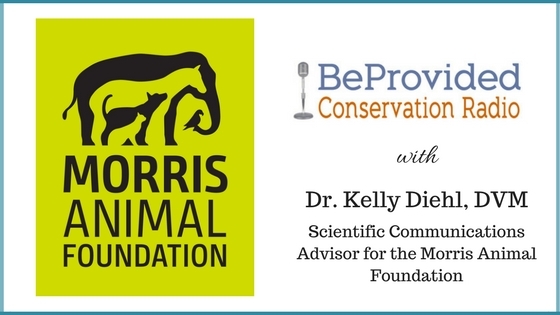 This week our podcast is with Dr. Kelly Diehl, DVM (Doctor of Veterinarian Medicine) of the Morris Animal Foundation. They are the foundation providing scientific research to help save our domestic animals, such as cats, dogs and horses, to wildlife around the world. Kelly’s passion and love for animals really shows in this interview making her a great spokesperson for the foundation and I enjoyed our conversation a great deal. I believe it is important to know the major leader in protecting our animals health, especially since most of us animal lovers have cats, dogs, horses, or any other domesticated friend. The Morris Animal Foundation was founded in 1948. Since that time they have invested in more than $100 million dollars toward 2,400+ studies addressing the emerging and established health challenges of a variety of species. Dr. Kelly Diehl gives us some examples of a few of these studies so we can get a scope of the research they fund. We would love it if you could listen in! We know when you do listen in, you will love the show. If you like what you heard, please share with the other animal lovers in you life! It’s just good to know the people out there who have the back of your loved animals.